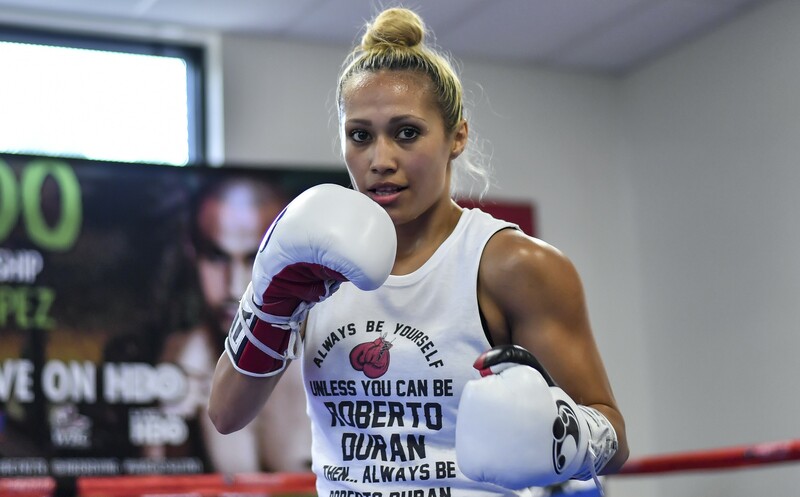 Seniesa ‘SuperBad” Estrada (15-0, 5 KOs) of East Los Angeles, Calif. scored a fourth-round technical knockout victory against Debora Rengifo (10-6-1, 5 KOs) of Rio Chico, Venezuela to capture the vacant WBC Silver Light Flyweight Title in the scheduled 10-round main event of “Mexicali Al Grito De Guerra” at Plaza De Toros Calafia in Mexicali, Mexico and televised on TV Azteca. Estrada vs. Rengifo was a 10-round fight for the WBC Silver Light Flyweight Title presented by Golden Boy Promotions. The event was sponsored by Tecate,”THE OFFICIAL BEER OF BOXING.” The fights took place on Saturday, Nov. 17, 2018 at Plaza de Toros Calafia in Mexicali, Mexico.